I was delighted when Sarah asked me if I would like to do a guest post for her blog. As a person who has spent years trying to find products suitable for my allergies and eczema I love to share them with others to help them out .I have been plagued all my life with sensitive body skin with keratosis pilaris (commonly known as chicken skin) that reacts to almost all soaps and cleansers. I have only found that simple clear shower gel and dove soap really cleanse me without burning my arms and legs. I recently discovered Betrousse website that offers full size product beauty boxes that are amazingly well priced so I ordered the organic box for £17.00. 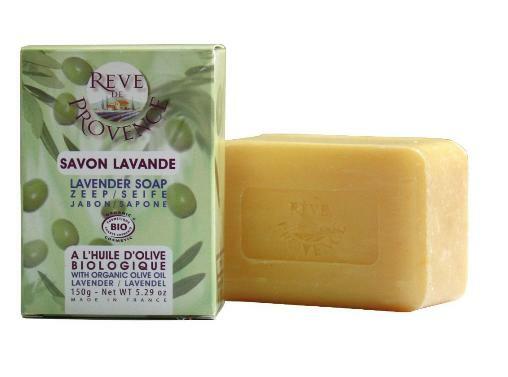 In this box I received a Reve De Provence organic olive oil and lavender bar soap which on opening the main box smelled divine!!! It doesn't look much but trust me!! I didn't hold out much hope for it as my experiences with soap bars have been really disappointing over the years, but it was new so I gave it a go. My first impression on wetting and lathering it up was surprise at how much creamy foam was produced. in my personal experience if a soap is suitable for sensitive skin it invariably smells of nothing nice and does not foam up at all. I applied it in the usual manner and after my bath noticed immediately that my skin was not dry or itchy with little to no redness. I completed my routine and over the next few weeks have noticed a smoothness and softness to my skin that has never before existed Miracle??? Well it is for me. After being so pleased with it I was dreading the thought of how difficult to obtain and expensive this could be for me so took to the "net " to research. I was beyond delighted to find you can get it from Amazon via subscribe and save so now will never be with out it again!!! You can buy it from Amazon for £4.49 a bar and cancel the subscription easily with no minimum purchase required. The bar itself (unlike dove) seems to be solid and not going down at all so I feel it will last ages too! Very interesting and informative post Rosemary. My skin is a bit sensitive so I have to be careful what soaps I use. I note that it is a lavender soap. I recently received a French Lavender Relaxing Bath Gift Set for my birthday. Thanks for this great review and have a good week.